Federico Minoli - Chairman and Managing Director of Ducati Motor Holding - and Claudio Domenicali - Product Director of Ducati Motor and Managing Director of Ducati Corse - together with Ducati Corse riders Loris Capirossi, Sete Gibernau and Vittoriano Guareschi were at Mugello to unveil Ducati's latest jewel of technology. "This is an important moment for us, another dream come true. Producing the Desmosedici RR means offering the ultimate expression of Ducati technology, while remaining faithful to the tradition of every one of our road and racing bikes," declared Federico Minoli. "It is a challenge that we wanted to accept and although relatively few bikes will be made, the RR will be a true object of desire for all Ducatisti. It will be the ultimate Ducati experience, one that best exemplifies the passion and the ingenuity for which we are famous. Meanwhile the twin-cylinder remains and will continue to remain Ducati's traditional engine, having equipped all of our production models in the past and equipping them in the future." 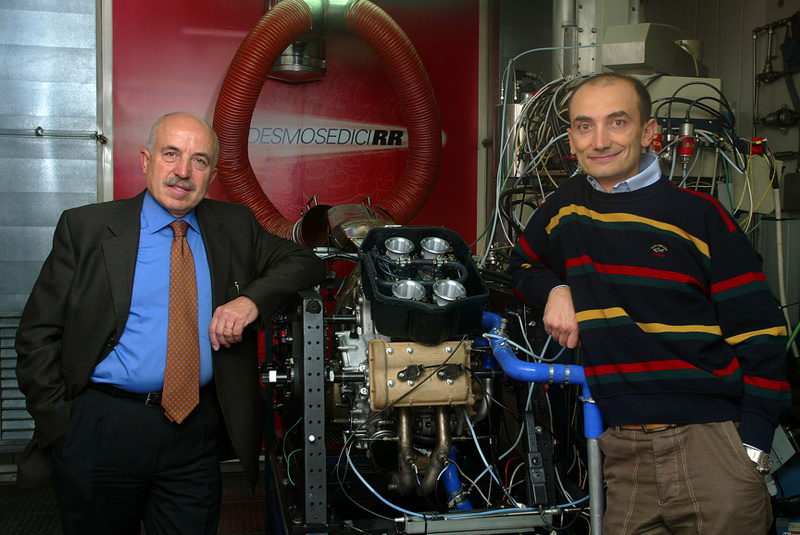 "The Desmosedici RR is a true Grand Prix replica," commented Claudio Domenicali. "The technological level of this bike is extraordinarily high and for the first time ever all the authentic performance and technology of the ultimate MotoGP racing machine have been transferred to a road-going motorcycle. Over 200 hp of power for a bike that features exclusive components and quality materials, destined to become the new point of reference for production motorcycles. There couldn't have been a better place than Mugello for the unveiling of this new bike and who better to take the wraps off it than Loris, Sete and Vittoriano, because this bike is also their bike and all of their experience has gone into developing this road-going motorcycle." 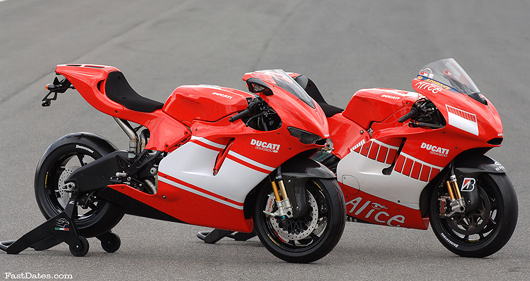 The first ever street legal MotoGP bike, the Desmosedici RR (left) offers 200+ Horsepower and is as true to its MotoGP6 works bike predecessor (right) as cost and streetability will allow. June 1st, 2006, Mugello, Italy - Ducati chose the magical atmosphere of the Italian Grand Prix at Mugello to launch the Desmosedici RR production prototype. The dream of a true GP replica has finally come true and the Desmosedici RR will be the first-ever road-going motorcycle to offer such a stunning wealth of performance and technology that comes directly from Ducati's experience in MotoGP. The RR derives from the Ducati Corse Grand Prix racing Desmosedici GP6, the same bike with which Loris Capirossi and Sete Gibernau are competing with in the 2006 MotoGP World Championship. Note the offset cat-eye headlights to not elimimnate the nose air scoup or revert to a center headlight like the Japanese superbikes. The Mugello launch is the perfect occasion to reveal the shape and the technical characteristics with which the bike will go to market, confirming the high technological features of this exclusive and esoteric machine. The body design and the aerodynamics faithfully reflect the Desmosedici GP6. The colour scheme, the fittings, the materials used in its construction as well as the technical features of the powerful four-cylinder desmodromic engine built by the Borgo Panigale factory engineers, leave no doubts whatsoever: the Desmosedici RR is the ultimate expression of the most extreme MotoGP racing machine today. The most beautiful sportbike ever? 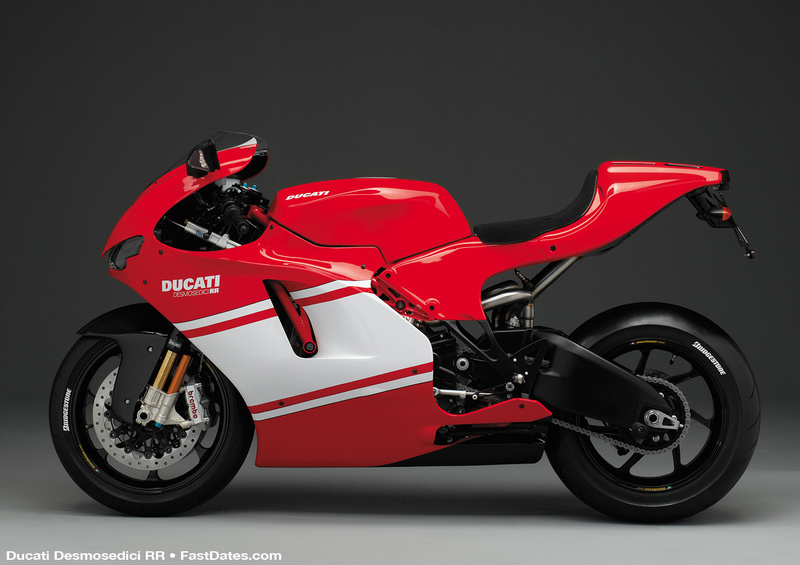 We hope the next generation Ducati Superbike will look just like this. The project is currently in the industrialization phase and, as previously announced, it will be a limited edition motorcycle, with approximately 400 bikes being produced a year. 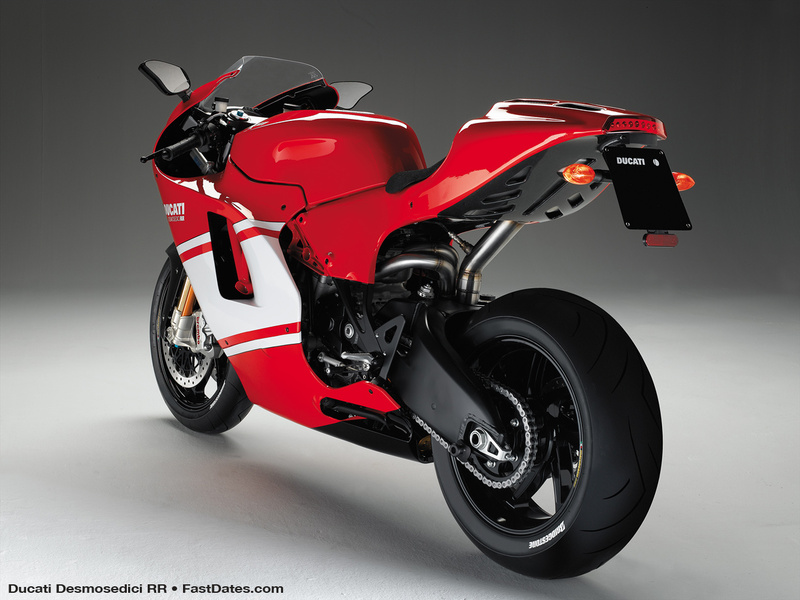 The RR is scheduled to arrive in the market in July 2007, while from June 2nd 2006 it will be possible to reserve the bike through the official Ducati dealer network, with Ducati 999R owners receiving priority. 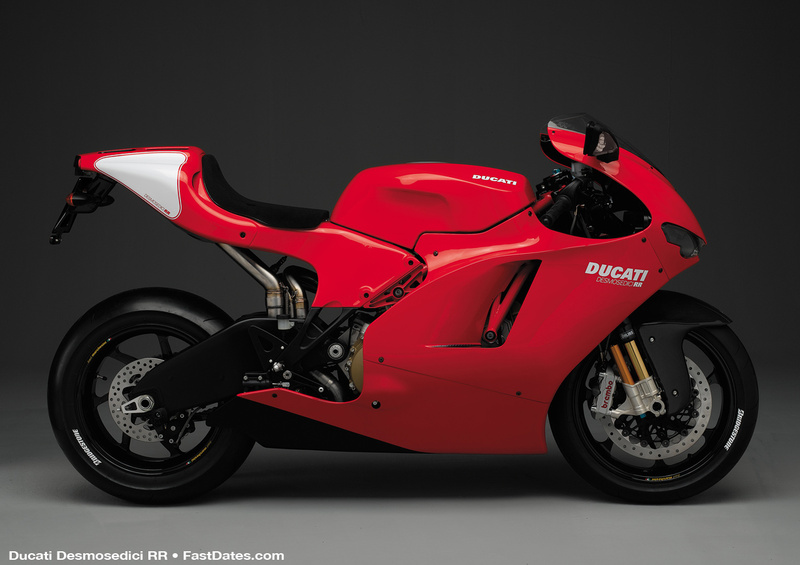 When the Desmosedici RR was first announced at World Ducati Week 2004 the announced delived of the first bike was to be May 2006 (at World Ducati Week 2006 which was cancelled due to company ownership changes and financial belt tightening) with a retail price around $50,000. As a current 999R owner we got our phone call from our local Ducati dealer yesterday, looking for our order and saying the price was now $69,995. When the Desmosedici RR rolls off the production line next year it will be eligible to compete in World Superbike where it would certainly be invincible with its newer generation chassis and much more powerful motor, but presently Ducati plans to continue in Superbike with their V-Twin Testastretta Superbike model in either 1000cc or 1200cc displacement to continue to showcase their desmo V-Twin street bike product line. Delaying production of the 1000cc Desmosedici until 2007 will also allow Ducati to remain eligible to compete in MotoGP when that formula downsizes to 800cc next year, and Ducati will be using a new prototype engine which shouldn't conflict with MotoGP's no production engine rule. This is certainly the finest, most impressive sportbike ever offered to the public, probably capable of winning World Superbike races right out of the box, and besting anything that Japan will have to offer to the public in the next 10 years. It's the new frontier of Ducati technological evolution, a dream come true, demonstrating once again the courage and the passion of Ducati, as well as the ability to transfer the experience of the racing world to a machine that is destined for road use. 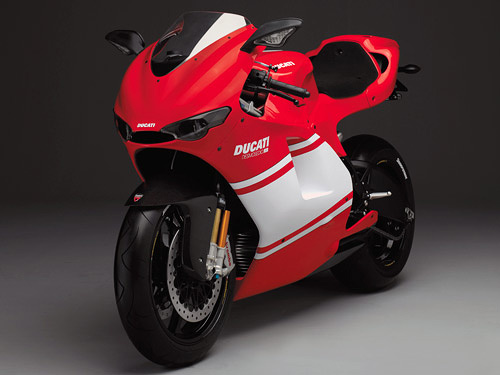 The Ducati Desmosedici RR features advanced technology and aerodynamics that are derived from the GP6 currently being raced in the 2006 MotoGP World Championship. The engine of the Desmosedici RR accurately reflects that of the MotoGP bike: Ducati's traditional desmodromic distribution, guaranteeing precise valve control up to the highest revs, is perfectly matched to the 989 cc four-cylinder 'L' layout, with four titanium valves per cylinder, in asymmetrical Twin Pulse configuration, producing a masterwork of precision engineering. The double overhead cams are gear driven, a sophisticated and reliable solution that enables precise valve timing in all conditions. This authentic copy of the Grand Prix engine is completed by a six-speed transmission, which retains its 'racing' characteristic by being cassette type, and a hydraulically actuated dry multi-plate slipper clutch. The aim of producing a light but robust engine has led not only to an unrivalled quality component design but also the use of exclusive racing-derived materials: sand-cast, aluminium crankcase and cylinder heads, titanium connecting rods and valves, sand-cast magnesium engine covers. Four 50 mm Magneti Marelli throttle bodies are present, with 12-hole 'microjet' injectors. For sophisticated management of the powerful four-cylinder engine a Magneti Marelli 5SM ECU and high-speed CAN line electronics have been used. An all-time 'first' comes with the use of a '4 into 2 into 1' exhaust, with "vertical exit" silencer, hidden in the tail cover. These are all benchmark performance features for a MotoGP replica bike, which is capable of delivering more than 200 hp of power with the 102 dB racing silencer and dedicated CPU race kit. Amazingly the Desmosedici RR with its catalytic oxygen sensor exhaust, homologated for road use, fully complies with Euro3 emissions regulations. The Desmosedici RR will be available with a special race kit that includes a 102 dB racing exhaust, a dedicated CPU, bike cover, paddock stand. For this exclusive Ducati which is priced at $64,995, a new dedicated service plan is included. Each Ducati Desmosedici RR owner can benefit with a three-year warranty and three years of scheduled maintenance, free of charge. Two versions of the RR will be available: 1) the Desmosedici RR - painted in 'Rosso GP', with a white number plate on the tail section; 2) the Desmosedici RR 'Team Version' - painted in 'Rosso GP', and as with the factory Corse bikes, has a broad white stripe on the fairing. A team sponsor decal kit will be provided with each bike. New lightweight Corse electronic multifunction dashboard with LCD ‘bar’ graph tachometer, trip/odometer, anti-theft immobilizer, lap time measurement, oil pressure, fuel reserve, EOBD, clock, air temperature, rev counter. 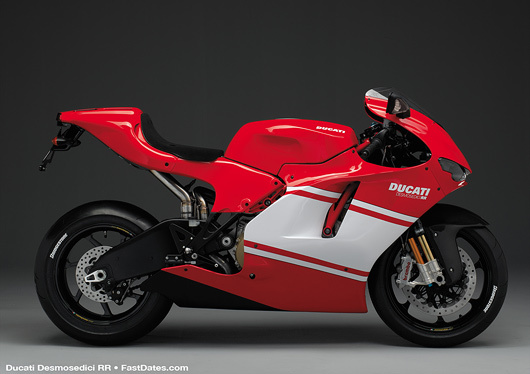 Two versions – 1) Desmosedici RR: Rosso GP with a white number plate on the tail section; 2) Desmosedici RR “Team Version”: Rosso GP with broad white fairing stripe. A team sponsor decal kit will be provided with each bike. The engine of the Desmosedici RR accurately reflects that of the MotoGP bike: Ducati’s traditional desmodromic distribution, guaranteeing precise valve control up to the highest revs, is perfectly matched to the 989 cc four-cylinder ‘L’ layout, with four titanium valves per cylinder, in asymmetrical Twin Pulse configuration, producing a masterwork of precision engineering. The double overhead cams are gear driven, a sophisticated and reliable solution that enables precise valve timing in all conditions. This authentic copy of the Grand Prix engine is completed by a six-speed transmission, which retains its ‘racing’ characteristic by being cassette type, and a hydraulically actuated dry multi-plate slipper clutch. Four 50 mm Magneti Marelli throttle bodies are present, with 12-hole ‘microjet’ injectors. For sophisticated management of the powerful four-cylinder engine a Magneti Marelli 5SM ECU and high-speed CAN line electronics have been used. An all-time ‘first’ comes with the use of a ‘4 into 2 into 1’ exhaust, with “vertical exit” silencer, hidden in the tail cover. These are all benchmark performance features for a MotoGP replica bike, which is capable of delivering more than 200 hp of power with the 102 dB racing silencer and dedicated CPU race kit. Amazingly the Desmosedici RR with its catalytic oxygen sensor exhaust, homologated for road use, fully complies with Euro3 emissions regulations. The engine clearly represents the beating heart of this fantastic motorcycle, but the technological advancements also extend to the chassis: a signature tubular trellis hybrid frame, refined components, and a superb carbon fibre body. This is a motorcycle that is destined for an expert rider, someone who is always looking for extreme sporting performance, as well as being an exclusive, esoteric, reliable product that is more than capable of track racing. The colour scheme of the Desmosedici RR was the work of Alan Jenkins, the designer and one of the men behind the Desmosedici MotoGP, who was also responsible for the aerodynamics package which is aimed at achieving maximum speed and excellent handling. The bike is totally inspired by the racing machine, the Ducati Desmosedici GP6, from which it inherits all the aggressiveness of its lines. It is fitted with a new lightweight multifunction dashboard, developed in collaboration with Ducati Corse, the same one that will be fitted to next year’s racing machine, the Desmosedici GP7. The bike’s development could not have been made possible without the significant collaboration of Vittoriano Guareschi, the official Ducati Corse tester, whose riding abilities and hundreds of hours of track time have made a fundamental contribution to the evolution of the project. For the first time the Ducati Desmosedici RR uses a new welded tubular steel trellis hybrid frame (ALS 450) with the frame geometry that is the same as that of the Desmosedici GP6. This construction guarantees an excellent stiffness to weight ratio, allowing superior manoevrability and riding precision. Attached to the red frame is the rear seat support in high temperature resin type carbon fibre. This material, normally used only on racing bikes, has the characteristic of being extremely lightweight but exceptionally rigid. The Desmosedici RR sports a new extra-long, cast, forged and pressed aluminium alloy swingarm. The geometry and the technology of this component derive directly from the MotoGP bike, and give the RR a high level of traction control, and excellent weight distribution as well as a superb stiffness to weight ratio. 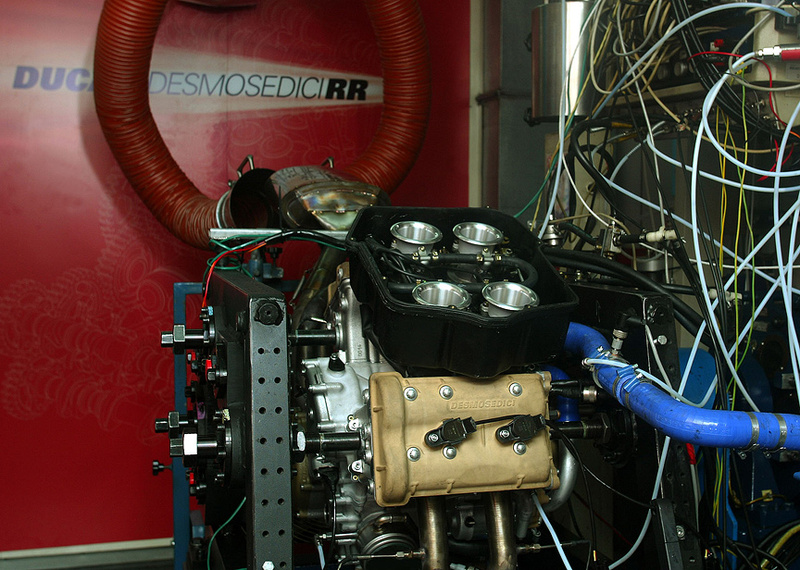 In the suspension department the Ducati Desmosedici RR features the most advanced technical components. The rear suspension geometry and layout is the same as that of the GP6, with the rear shock attached above the swingarm and to a rocker, which is hinged to the crankcase. The front suspension features 43 mm upside-down Öhlins FG353 pressurized forks (PFF), with TiN coated sliders. The forks, which come directly from competition use, as well as being pressurized thus ensuring excellent track performance, are fully adjustable in preload, rebound and compression. The rear shock is also Öhlins and has rebound, low/high speed compression adjustment and hydraulic preload adjustment. For the first time ever, this Ducati production motorcycle features Marchesini forged and machined magnesium alloy wheels, with 7 spoke design as on the GP6. This helps to reduce unsprung weight and inertia, all the while improving handling and suspension response. With the aim of producing the ultimate track performance, Ducati in collaboration with Bridgestone is developing special tyres for the Desmosedici RR. The tread pattern, construction and profile are being specially developed and produced by the Japanese tyre manufacturer. The numerous racing components of this high-performance machine also include its Brembo brakes. Up front the Desmosedici RR features a new pair of radial ‘monoblock’ callipers with four 34 mm pistons: monoblock technology, until now only used for racing callipers, allows calliper stiffness to be increased, thus improving braking response; the front brake system is completed by a radial master cylinder, with hinged lever and remote ‘quick’ adjuster. The pair of front brake discs are the same as those used on the GP6 in its wet weather race set-up: two semi-floating 320 mm x 6 mm discs, with machined flange. The Brembo rear brakes are made up of a 240 mm fixed disc and a floating calliper with two 34 mm pistons. The Desmosedici RR will be available with a special race kit that includes a 102 dB racing exhaust, a dedicated CPU, bike cover, paddock stand. 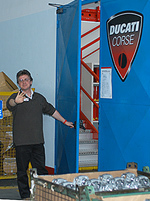 For this exclusive Ducati, a new dedicated service plan is included. Each Ducati Desmosedici RR owner can benefit with a three-year warranty and three years of scheduled maintenance, free of charge. 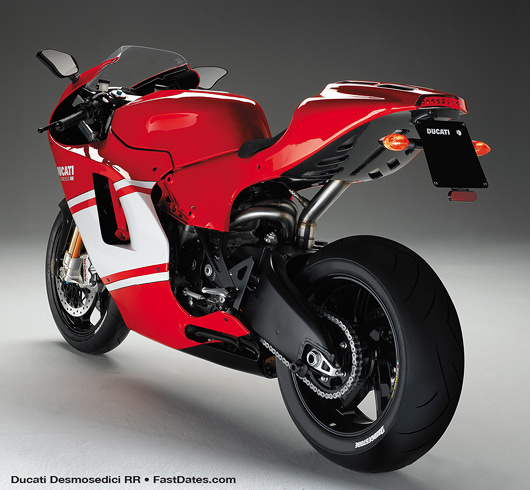 Two versions of the RR will be available: 1) the Desmosedici RR - painted in ‘Rosso GP’, with a white number plate on the tail section; 2) the Desmosedici RR ‘Team Version’ - painted in ‘Rosso GP’, and as with the factory Corse bikes, has a broad white stripe on the fairing.